DIY fireplaces vs contractor built fireplaces – which one would I choose? You can probably guess that one based on the URL of this website. I always gravitate toward trying to build everything myself and because of this I rely on a few specific fireplace building tools. 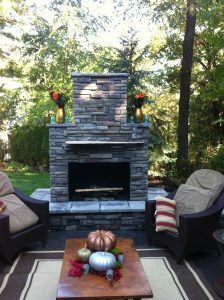 I believe that most people have what it takes to build their own outdoor fireplace. When you think about the cost savings alone, you will understand that it just makes sense. If you can lift 30 pounds repeatedly and occasionally a bag of mortar, then you can do it so if you choose this route you’ll need a few different tools to start construction. This is not a comprehensive list of tools needed but it’ll definitely get you going. A wheelbarrow, hose, and hoe for mixing the mortar, as well as a trowel for laying the block are helpful items. You’ll need a level, preferably about a 4-footer and a measuring tape. The wheelbarrow and hoe will be to mix your concrete and mortar. There are many different sizes and shapes of trowels, and it will become apparent which one you prefer once you use a couple different ones. You’ll need one that is big enough to transfer and apply the mortar but not so big that you feel as if it’s inhibiting your ability to work cleanly without dropping mortar everywhere. If blocks will be cut, you will need some type of saw with a diamond blade. I have used a circular saw as well as a 10” grinder. The grinder is by far my go to method for block cutting as it is very easy to control. This cutting process is best done dry, but make sure to use eye protection as small pieces of concrete from the block will be flying around. When you cut blocks, make sure to account for a mortar gap. You will want it to be around 3/8”. If it is slightly smaller or even larger than 3/8” you don’t have to worry. Mortar will make up for any imperfections. When you have a design to follow or a plan that will guide you along the way, you will be ready to start laying block. Good luck with your construction and happy building. We always welcome questions and additional information to follow to our other readers. Brillance for free; your parents must be a sweetheart and a certified genius.